WaveMaster 8 Zi combines the highest bandwidth and sample rate with the superior performance of the X-Stream II architecture to maximize speed in all aspects—high bandwidth signal capture, 10–100x faster analysis processing, instantaneous instrument responsiveness, and 20x faster off-line data transfer. Complete bandwidth upgradability makes it easy and affordable to stay current with emerging high-speed technologies and serial data standards. LeCroy has broken bandwidth barriers by combining custom designed SiGe high-speed components with 5th generation Digital Bandwidth Interleave (DBI) technology to achieve unprecedented real-time oscilloscope performance: 30 GHz, 80 GS/s, and 512 Mpts/Ch Analysis Memory. X-Stream II architecture provides 10–100x faster processing of long records, true 512 Mpts analysis memory, and instantaneous instrument responsiveness. When off-line data analysis is preferred, the LeCroy Serial Interface Bus (LSIB) provides up to 325 MB/s data transfer speeds. 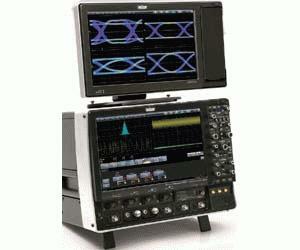 A 15.3" WXGA touchscreen display provides 50% more viewing area compared to other oscilloscopes in this class. Both 50 Ω and 1 MΩ inputs are standard on all oscilloscopes, as is support for all LeCroy probes (including passive probes) without the need for easy to lose external adapters or expensive power supplies. As memory and sample rate can be interleaved, so can bandwidth. Using high- performance microwave and RF technologies, and high-speed processors and digital signal processing (DSP), LeCroy intelligently operates high-speed analog components comfortably within their rated bandwidth range while providing twice the four channel bandwidth on two channels. This approach offers better signal fidelity compared to “stretching” of components beyond their rated bandwidth. From the perspective of bandwidth, sample rate, processing speed, responsiveness, display size, and range of capability, the WaveMaster 8 Zi platform is clearly superior and will remain so for many years to come. With the widest bandwidth upgrade range, an engineer who is working on 2nd generation technologies today can confidently know that WaveMaster 8 Zi will support 3rd or 4th generation technology needs several years from now.